The State Park has created three designated hiking trails -- the Indian Nature Trail, the Dorn Trail, and the Kelsey Creek Trail. Docent-led walks are as advertised throughout the year and vary with the season, with focus on the changing flora and fauna in the park. To check the hiking schedule, please call 707-279-4293. The Indian Nature Trail -- Located at the park entrance, this trail is a moderate half-mile, self-guided trail that will help you understand how the local native Americans used the native plants and other resources of this area to meet their daily needs. A guide to the posted trail can be obtained at the entrance kiosk or the trail head. The Dorn Trail -- Guided interpretive hikes are given on the 2.5-mile Dorn nature trail, which illustrates occurrences during the historical Indian settlement of the area and the natural features that occur today throughout the area. 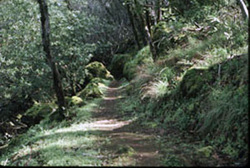 This trail winds through oak woodlands and chaparral. You will see a variety of vegetation, including oaks, manzanita, and a wide variety of native wildflowers. You can start the trail at several points. ADA improvements have been made to the trail to provide access. ADA access is from the Upper Bay View campground. The 2 1/2 -mile trail is moderately strenuous, but there are some nice vistas and a pleasing variety of natural environments to enjoy. Drinking water is not available on the trail. The Kelsey Creek Trail -- This unique boardwalk trail is a riparian trail following the shoreline on Cole Creek, Old Kelsey Creek, and the lakeshore. From this ADA-accessible trail you can see otters, Western Pond Turtles, muskrats, and a large variety of birds. The trail is also a popular fishing access point. Those picnicking or hiking for the day can park at the boat launch parking lot or at the swim beach parking lot. 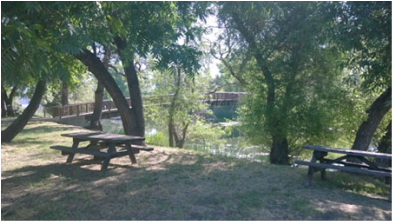 There are picnic tables and barbecues located throughout the boat launch picnic area. There are limited picnic tables at the swim beach, four of which are ADA accessible. Groups of up to 200 persons can reserve this facility by contacting the park directly. 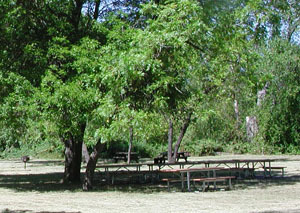 The group site includes two large barbecues, water, electricity, and night lighting on request. For reservations, please call 707-279-4293.